In this episode of Flite Test, Josh, Josh, and Chad teach us about Intermediate FPV! Cloverleaf antennas, GoPro Cameras, and a new pair of Fat Shark goggles really help Josh Scott fly FPV. Watch to see more. Welcome to the wonderful world of FPV - it brings RC flying to a whole new level. What a fantastic episode guys! Talk about capturing the essence of FPV. That was awesome . . well done on the landing too Josh . . talk about doing it under pressure!! Nice side by side video of the transmitted video and the recorded video from the GoPro! Great episode! Awesome landing JS!!!! Yeah, that was indeed great! I think that on a small screen, the image quality with that antenna is perfect! Josh s your flying skill is improving nicely. You've come a long way buddy. I've really got to get in on this fpv thing. I just need a way to sneak it by the wife. Nice episode! I want an FPV setup as well now! Would the image quality be much lower if you hadn't use the cloverleaf antenna? Also, is the Bixler really that cheap? 50-something dollars? I REALLY need to get one. Well, yes. The Almost Ready to Fly Bixler is $52+. But then you'll need batteries, a charger, and a Receiver/Transmitter of course. The box that comes with all you need if you don't have anything at all costs a little bit over $100. Shipping is the bummer, costs like $40 for the ARF and $60 for the RTF. I am flying a Bixler too but with a 5.8GHz setup. Good plane, except for the nose that always shows up on the picture. Painting it black is a good idea, a bit less extreme that chopping it off! Awesome CL video franck. Thanks for posting. What OSD were you guys using? Thank you for that video. Great demonstration. What is the RX Female connector type from HK? You have a link to the Hobby King RX/TX. So I am hoping you will know what the female type is on the RX. 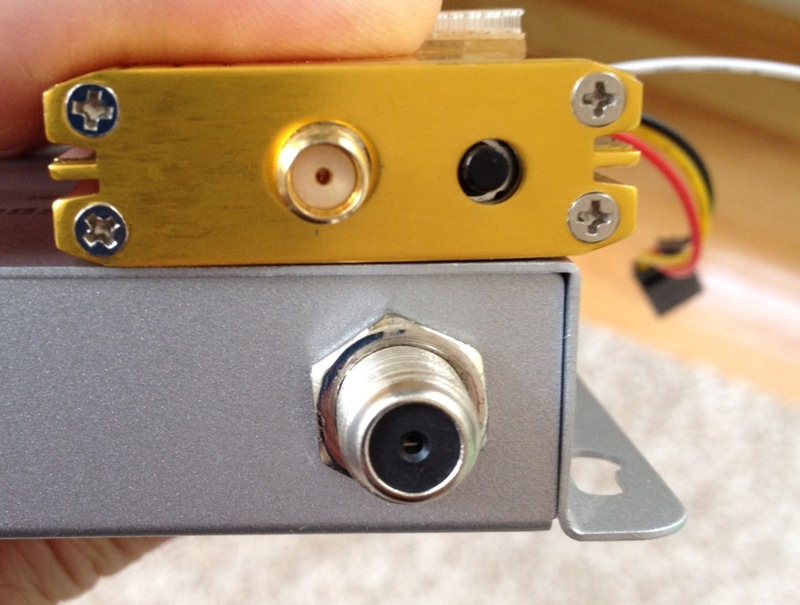 I built the skew planar and clover leaf (ibcrazy design - rcexplorer.se instructions) with SMA type connectors... the RX is not SMA much to my disappointment. TX is. Well, what ever it is, do you guys know where to buy an adapter? I'd hate to have to build another skew planar. It's not easy. I dont know what you mean with mini UHF. Could you post a picture please? I'll get a pic up today. I'll get a picture up today to show the size comparison. So, the smaller one is the SMA. The larger? not sure what this is.